The Yankees took advantage of an unusually bad Angel bullpen to win the first game of the four-game series against the Angels 7-4. A.J. Burnett settled down after a bad start and was nearly matched by Angels starter Anthony Ortega through seven innings. Tied at one going into the second inning, Burnett allowed two more Angels to score, including a Mike Napoli home run. The Yankees climbed back with a run in the third and then two more in the fourth. Jeter singled to right to score Nick Swisher, and Ramiro Pena also came around to home when the ball zipped past Bobby Abreu’s glove. The Angels tied it back up at four when Chone Figgins singled in Erick Aybar. Burnett made it through seven complete innings thanks to a timely 5-4-3 double play in the seventh. The Yanks broke the game open in the eighth when Justin Speier came on in relief. With one out and Robinson Cano on first, Jorge Posada hit a ground-rule double robbing him of a sure RBI. The Angels then smartly (at the time) walked the red hot Swisher to face Melky Cabrera. Cabrera delivered on the first pitch he saw to score Cano. Then Pena, of all people, doubled down the right field line to score two more runs – his first two career RBI. Mariano Rivera entered in the ninth looking to prove last night was a fluke. And he did. Torii Hunter led off with a hard single up the middle, but Rivera came back with two strikeouts – both on nasty cutters. He got Howie Kendrick, the Yankee killer, to groundout back to himself to end the game. Full box score here. It was a nice win for the Yankees that they were supposed to win. Even though the Angels are normally the Yanks’ weakness, the Yanks had a big advantage in the pitching matchup - plus the Angels were playing without Vladimir Guerrero. - Pena singled and scored as well as the two-RBI double in the eighth. I felt really good for Pena when he got his first two RBI. He should play third every game until A-Rod returns. - Swisher was on base three more times in this game. He’s now been on base nine times in his last fourteen trips to the plate. - Phil Coke pitched a perfect eighth, and gave a huge fist pump when he struck out Bobby Abreu on a slider in the dirt. Friday night features a battle of two starters having good seasons so far. Jered Weaver (2-1, 2.45 ERA) faces Andy Pettitte (2-1, 2.96 ERA) at 7:05 p.m. I received my copy of S.I. today only to find Zack Greinke on the cover. He is 5-0 with an 0.50 ERA this season, and leads the majors in both categories. This was not news to me because I have a good friend in my hall bragging about his greatness in my ear every day – thanks to an idiotic bet I took him up on. I gave him 10:1 odds that Zack Greinke will not win the Cy Young Award this season. I know it’s only April, but he’s 5-0, and who else in the American League is going to take it from him? If Greinke wins the award, I have to hand him a c-note. FML. The Yankees took two out of three from the Royals earlier this April, and fortunately evaded Greinke’s start in the rotation. Hopefully by the time the two teams meet again at the end of September, Greinke will have cooled down just a little bit. What’s the difference between steroids & HGH? When performance-enhancing drug (PED) discussion comes up in the news, steroids and HGH are thrown around all the time making it seem like they are synonymous. However, I recently sat down with an expert on the matter, Quinnipiac baseball athletic trainer Adam Pallone, who clearly explained the difference. And it is a big one. Anything that enhances performance is classified as an ergogenic aid, steroids would be one example. … Steroids are the big one, human growth hormone is the other big one. Both of them are two separate categories encompassed under that sports enhancement umbrella. Pitchers will use [steroids] more for recovery purposes. You’ll see a lot of relievers using it because ‘I have to pitch night after night.’ Sometimes it’s not to up that 90 mph fastball to a 95; sometimes it’s just to be able to throw again tomorrow. For hitters, being able to react to a 95 mph pitch, that’s a split second thing. Being big and stocky and having large muscles doesn’t make you faster to your reaction, it makes you slower. The tradeoff is, you still gotta be able to hit the pitch 400 ft, 500 ft. And that’s where I think the big oversight of all of this is – human growth hormone. The bottom line is, steroids make you stronger and slower, but HGH improves your hand-eye coordination and eye sight, which allow you to make better contact with the ball. Pallone graduated in 2004 from Central Connecticut State University with a degree in athletic training – a highly-touted program at CCSU. Another huge rally was the difference in this game against the Tigers. Joba Chamberlain had trouble finding the strike zone early in the game, but also induced a lot of fly outs early in the count. Mariano Rivera was forced to pitch in the ninth, and the Yankees pulled out another victory to put them back over .500 at 11-10. After 32 pitches, Chamberlain had thrown 17 balls, which led to Detroit’s lone run in the third inning. The Yankees responded in a big way in the fourth behind two big hits. After Jorge Posada stole his first base since 2007, Nick Swisher, batting lefty, jacked a three-run homer over the left field wall. Later in the inning, Johnny Damon doubled in another run to force rookie starter Rick Porcello out of the game. Then with the bases chucked, Hideki Matsui drove a ball over the left fielder’s head to clear the bases. Swisher homered again in the fifth, this time batting right-handed, and is tied for fourth in the league with seven roundtrippers. Chamberlain pitched through the seventh inning in just 88 pitches, but was relieved by Phil Coke in the eighth. The Tigers gave every Yankee fan a heart attack in the ninth inning after Curtis Granderson hit a three-run homer off Rivera to make the score 8-6. But Mo popped up Placido Polanco to end the game. Full box score here. If the Yankees had lost tonight, I probably would have cried. I’m glad Joba followed Phil Hughes’ performance last night with a strong outing. He could have pitched the eighth, but I believe he was rightfully pulled to preserve his arm for the rest of the season. There was no need to pitch him an extra inning with a seven-run lead. - Without Swisher, the Yankees would probably be in fourth or fifth place right now. The Yankees are now 5-1 when he homers in a game. - Mark Teixeira has been in a bad slump. He’s hitless in his last 12 plate appearances. - Chamberlain got out of a huge two-out bases loaded jam in the third by striking out Miguel Cabrera. After that he was dominant. The Yanks start up a four-game series with the Angels tomorrow night back in the Bronx. A.J. Burnett (2-0, 5.47 ERA) squares off against another rookie starter, Anthony Ortega (0-1, 7.20 ERA). First pitch is set for 7:05 p.m.
Phil Hughes, who was 3-0 with a 1.86 ERA in triple-A, was called up to start last night’s game against the Tigers. Hughes continued his dominance this season and ended the Yankees’ four-game skid. Before the seventh inning, the Yankees had stranded runners in scoring position in three different innings. In the seventh, the Yankees rallied for six runs with two out, four of which came from a Jose Molina grand slam. Four Yankees had already scored in the inning combining for 10 runs. Nick Swisher added a solo shot in the ninth. The game was scoreless going into the seventh because Hughes and Detroit’s Edwin Jackson had both pitched shutout ball. Both were removed after the sixth because of high pitch counts. Full box score here. The win was the icing on the cake of an awesome day for the Yankees. Hal Steinbrenner lowered the ticket prices, finally. Alex Rodriguez, who hasn’t been mentioned in a while on this blog, has been rehabbing ahead of schedule and is expected to be back in pinstripes as early as next week. - Swisher scored three times including a homer in the ninth inning. - Melky Cabrera was on base four times and scored twice. He was one of four Yankees with two hits. - Hughes deserves a lot of credit for halting the losing streak. He allowed two hits and two walks, and struck out six over six innings. - Mark Melancon pitched a perfect seventh inning, and struck out Brandon Inge. The Yankees will look to take the series tonight as the game will air nationally on ESPN at 7:05 p.m. It will be Joba Chamberlain (0-0, 3.94 ERA) vs. rookie Rick Porcello (1-2, 4.50 ERA). The Yankees and Red Sox were tied going into this series, but the Red Sox were riding a seven-game win streak heading in. No team was stopping the Sox this weekend. They stole three straight games from the Yankees, literally. The Yanks had a lead in each game, and each game they blew it. The Yankees took the lead off Justin Masterson in the third inning when Brett Gardner hit a sacrifice fly to drive home Hideki Matsui. The Red Sox tied the game back up in the bottom of the third with another sac-fly – this one off the bat of David Ortiz scoring Jacoby Ellsbury from third. The Red Sox scored the rest of the game’s runs in the fifth inning off Andy Pettitte. Ortiz doubled home Jason Varitek to take the 2-1 lead, and Ellsbury advanced to third. Ellsbury noticed Pettitte was pitching from the windup, so he bolted for home when he started his slow delivery. He slid in safely headfirst, and eventually came out of the dugout for an encore. J.D. Drew’s ground-rule double drove in the fourth and final run of the game. Full box score here. Wow. If I were Joe Girardi or Dave Eiland, I would be scared stiff. Getting swept by the Red Sox at Fenway is the worst thing the Yankees can do except for being swept by them at home. This weekend was a disgrace to say the least. If you are Pettitte, you have to be aware of Ellsbury’s speed at third and pitch from the stretch. The Red Sox had all the momentum in the world on their backs after that, and there was no way they were going to let this game slip away from them. - Robinson Cano added two more hits to his team-leading total. He also leads the Yankees in every other major offensive category. - Mark Melancon made his major league debut tonight, and it was beautiful. Two innings pitched, one hit, one walk, one strikeout and no runs. The Yankees can forget about this weekend on the plane ride to Detroit. CC Sabathia is slated to start against Justin Verlander in game one tomorrow night at 7:05 p.m.
7th Featured Yankee Card of the Week! 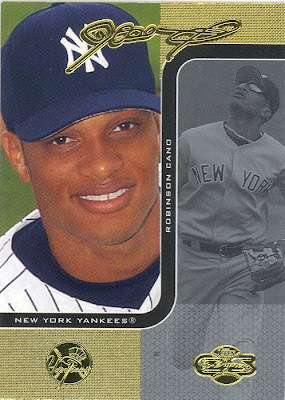 I have chosen this card of Robinson Cano for this week's card because he is the only one on the team that is off to a good start. He leads the team with a .373 batting average, 5 homers, 15 RBI and 15 runs scored. This card is a 2006 Topps Co-Signers insert. As usual, the card does not have much value, but it is a pretty cool looking card. When you hold it, the gold parts are shiny to make the card stand out. In my weekly poll, fans voted that Chien-Ming Wang should be sent down to the minors. The Yankees have already taken action with Wang, sending him to the 15-day DL. If the Yankees actually sent him down to the minors, then he could be claimed by other teams. It’s not a realistic choice, but I’m sure most Yankee fans wouldn’t mind letting go of Wang at this point. His ERA is 34.50. A heartbreaking loss for the Yankees. It seems every year Mariano Rivera gives up his first runs of the season to the Red Sox. Joba Chamberlain had a good start, but nothing mattered after Jason Bay's bomb. Going into the seventh inning, both starters were out of the game, and the score was tied at two. But the Yanks got to Hideki Okajima in the seventh, scoring two runs from a Mark Teixeira single and a Robinson Cano sacrifice fly. The Yankees had the game wrapped up going into the ninth inning, but Rivera gave up a two-run shot to Jason Bay in the bottom of the ninth to force extra innings. The Yankees lost it in the bottom of the 11th on a Kevin Youkilis home run over the green monster. Full box score here. I can’t believe Rivera finally blew it. Something about playing the Red Sox in April does not bode well with the Yanks. At least it’s the first game of the series, so they will have time to make up for it. Jose Molina had a really nice game actually. He went 2-for-3 and walked twice. Chamberlain had a good start, allowing only one earned run over 5 1-3 innings. He had to leave early because of his four walks and 91 pitches. The second game of the series is today on Fox at 4:10 p.m. A.J. Burnett takes on Josh Beckett in what should be a great matchup. I've never seen him pitch live, but Melancon is somehow exceeding expectations in Scranton/Wilkes-Barre. With the recent struggles in the Yankees’ bullpen, it certainly would not be a bad time to call this guy up. During spring training, Peter Abraham predicted that Melancon had the best chance of any Yankee prospect to replace Mariano Rivera as closer when he retires. Look at the picture on the left. There is no excuse for having that many empty seats in a brand new stadium in the middle of a game. I view this picture as a form of demonstration from Yankee fans. This picture doesn’t even show the absurd number of empty seats behind home plate, which is more embarrassing because it is the most common camera angle. Yes, there were some rain drops during this game, but that does not explain how the seats surrounding this overpriced section are completely filled. If this picture does not persuade the Yankees to lower their ticket prices, I don’t know what will. Commissioner Bud Selig commented on the matter, but did not offer any form of advisement. "They're going to discuss it, and whatever adjustments they want to make, they should make," Selig said. "I wouldn't be presumptuous talking about what they should or shouldn't do." Selig’s doing the right thing for now, but if nothing changes, he will be forced to make action. An entire section of empty seats in a newly opened stadium is preposterous. It gives the Yankees less of a 10th man advantage, and portrays a terrible image of the Yankees. When the Yankees visit Fenway, every year their fans seem to give them an advantage that was unmatched at the old Yankee Stadium. Now if the Yanks can’t even fill all of their seats, how do they expect to compete with the Sox? It is an utter embarrassment to have a lot of empty seats behind home plate. The Yankees are charging up to $2,625 per seat. Either the Yankees will lower the prices, or eventually Selig must intervene. A new state of the art stadium should be packed every night, and not have empty sections. The biggest rivalry in all of sports continues tomorrow night. The Yankees will visit Fenway for the first time this season, and the Red Sox will use their home-field advantage attempting to come out of the series ahead in the standings. The pitching matchups could not be more equal, and the two teams’ records actually are equal at 9-6. Joba Chamberlain squares off against Jon Lester in the first affair, and it should be a good one. Both pitchers are sporting ERAs over five, but those numbers will go down the more they start. They are both exciting to watch because they can bring the heat and have nasty breaking pitches on top of that. On Saturday, A.J. Burnett takes on Josh Beckett at 1:05 p.m. Both flamethrowers know how to pitch in big games, and this will certainly be hyped up as it will air nationally on Fox. Andy Pettitte faces Justin Masterson on ESPN’s Sunday night baseball at 8:05 p.m. Masterson had a strong first start against Baltimore, while Pettitte has been tossing gems all season. In a game that should have been won in the seventh inning, Melky Cabrera homered twice - his second being a walk-off homer in the 14th inning. It's hard to remember that CC Sabathia started the game, but he did, and was less than impressive. The win makes it three straight heading into Boston for the first of 18 games in the season series. The first seven innings were completely different than the last seven. The first seven featured both teams in a game of tug of war and both were still tied by the end of the seventh. The game remained tied at seven for six and a half innings behind superb pitching from both squads - Dan Giese for the A's and Jose Veras for the Yanks. After Nick Swisher walked for the third time in the game in the bottom of the 14th, Cabrera delivered the with a booming line drive to a half-empty set of right field seats. Full box score here. I thought it was a huge win because of the confidence it gives to the bullpen. 7 1/3 innings of shutout baseball is very nice to see, especially coming after Sabathia's wretched start. Also, the emergence of Melky could be today, as he has upped his batting average to .304 with his two homers today. Brett Gardner pinch hit for Cody Ransom in a bases loaded, one-out situation, and popped up to third. So even though Gardner blew Cabrera out of the water in spring training, Cabrera is proving that he can do it in the majors. It will be interesting to see how Joe Girardi splits up their time in center the rest of the season. - Cabrera's two homers were the difference in the game. He totalled three RBI, but also struck out three times. Go figure. - Each of the Yankees' starters collected one hit and seven collected at least two. They combined for 16 hits and seven walks leaving 13 men on base. - Sabathia pitched terribly and it showed on his line: 6.2 IP, 6 H, 7 R, 6 ER, 4 BB and 2 K.
- Jose Veras pitched 3.1 terrific innings. He baffled the A's with his breaking pitch and struck out four to earn the win. The Yankees will enjoy an off day tomorrow and travel up to Boston to begin a three-game weekend series. The first matchup is Joba Chamberlain vs. Jon Lester at 7:10 p.m. on Friday. Mariano Rivera's save in the Yankees' win last night marked the 57th time he has recorded a save when Andy Pettitte starts. This ties the record for win-save combinations, originally set by Dennis Eckersley and Bob Welch. The 5-3 victory improves the Yankees' record to 8-6, while the Athletics fall to 5-8. Brett Gardner made the #3 play on SportsCenter with his diving catch towards the center field in the first inning off Jason Giambi's bat. Then in the second inning, Gardner did it with the bat when he drove in two runs starting a four-run rally that proved to be the difference in the game. The A's mustered a small rally in the fourth off Pettitte, but they could only manage two runs off the lefty. They scored one more off Brian Bruney in the eighth, but Rivera closed the game out for the fourth time this season. Full box score here. It was a nice win for the Yanks after last night's rain out. This makes two straight wins after absorbing the 22-4 beating from the Indians last Saturday. Maybe that loss did more good than bad for the team because it showed them exactly how not to win. Meanwhile, Xavier Nady will not need surgery because he only has a partially torn ligament, according to Jon Heyman. Some people might be saying that it's not that bad of a hit for the Yanks because of Swisher's surprising start, but I disagree. Having Nady in the lineup or on the bench puts less pressure on Swish and adds depth to the team, which means a lot. - Gardner really provided the spark the Yankees needed in the first inning, and then showed up on the offensive side as well. After he drove in the Yanks' first two runs, he stole second base - his fourth of the season. - Johnny Damon had a nice game too, going 2-for-5 with a homer and two RBI. - Pettitte moves to 2-0 on the season, and his turned in three excellent starts. Despite striking out zero batters, he gave up two runs and watched his ERA rise to 2.53. - Rivera converted his fourth save in as many chances, and is yet to allow a run. You cannot ask for more from him. CC Sabathia will make his second bid at his first win at the new Yankee Stadium today at 1:05 p.m. Sabathia (1-1) will face Oakland's Brett Anderson (2-1). Lineups and updates later. 6th Featured Yankee Card of the Week! 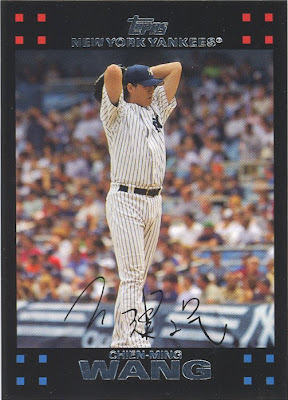 I figure since Chien-Ming Wang has been such a distraction in the news lately, it was his turn for the Featured Yankee Card of the Week. Maybe this post will be the turning point for him in the season. 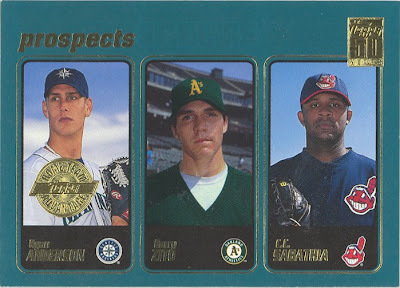 It is a 2007 Topps card, and is worth near the price of a quarter. I bet this was a pretty easy picture to take since Wang pauses at the top for about a half an hour. On September 21, 2008, the Yankees defeated the Orioles 7-3 at the last game ever played at the old Yankee Stadium. However, the Yankees couldn't get it together in the first game at the new Yankee Stadium opener against the Indians. Despite being tied at one going into the seventh inning, the Yanks bullpen imploded in the seventh and the team lost 10-2. On this historic day, CC Sabathia took on Cliff Lee. They each gave up one run, so the game was decided by the teams' bullpens. Sabathia was pulled with two outs in the sixth because he had already thrown 122 pitches. Phil Coke finally did something right by inducing Grady Sizemore to fly out. But the trouble began for the Yanks in the top of the seventh after they were retired in order in the sixth. Jose Veras took over for Coke in an attempt to hold the game to a tie. Instead, he allowed a walk and two doubles, and was pulled immediately by Joe Girardi. Although, Damaso Marte was even worse. He gave up a grand slam to Sizemore and two other runs. Lee was replaced in the seventh inning by Rafael Perez, who ran into some trouble but escaped it only allowing one run. With men on first and second and no out, Jorge Posada, who hit the first home run in the new Yankee Stadium in the fifth, grounded into a double play. Luckily, the Yanks had the streaking Cano up next, and he delivered a clutch RBI-single. But that was the end of the rally, and the Yanks could not do anything about Cleveland's insurmountable lead. The final score: 10-2. As John Sterling would say, "This is certainly not the way the Yankees drew this one up. You can never predict baseball." (This is an indirect quote, but you get the idea.) For once, I agree with Sterling. Sabathia was coming off a great outing, and Lee was 0-2 with a 9.90 ERA. Sabathia was good, but he was not economical with his pitch count and it costed the Yankees their home-opener. According to Joshua Robinson of the NY Times, the fans began to joke about calling Nick Swisher into pitch, chanting, "We want Swi-sher." That is embarassing, and unfortunately will forever be remembered. - Other than Posada's homer, Cano was the only standout performer. He went 3-for-4 with an RBI to improve his batting average to .421 for the season. - Sabathia's final line: 5 2/3 IP, 1 ER, 5 H, 5 BB, 4 K. Everything was good except the walks and the pitch count. The Yankees will look to redeem themselves tomorrow at 1:05 p.m. Fan-favorite Joba Chamberlain will take on Anthony Reyes. After dropping the first game fo the series 15-5, the Yankees stole the last two games away from the Rays in the late innings. The Yankees move one game ahead of the Rays in the AL East for sole possession of third place, ironically trailing the Blue Jays and Orioles. B.J. Upton and Carl Crawford came through with back-to-back RBI doubles off Andy Pettitte in the third inning for the first two runs of the game. The Yankees responded immediately in the top of the fourth to tie it up at two. Nick Swisher led off with a single and then Robinson Cano drilled a two-run shot to center. However, Carlos Pena regained the lead for the Rays in the bottom of the fourth with a bomb of his own. It was a quiet game until the top of the eighth when the Yankees set off alarms in the Rays bullpen, again. Derek Jeter led off with a double, and then Johnny Damon brought him around with a double of his own to tie the game at three. Pettitte was pitching great, but was pulled with one out in the eighth after 96 pitches. Brian Bruney stepped in and struck out Upton and Crawford to send it into the ninth. After Brett Gardner struck out, Cody Ransom, who was 2-for-24 going into the at bat, lined a double to center. Captain clutch, Derek Jeter, followed with a double over Upton's head to put the Yanks on top 4-3. Mariano Rivera retired the side in order for his second save of the season. Full box score here. Peter Abraham reported before the game that Xavier Nady will need to undergo surgery on his elbow. He left the game last night in the seventh inning. Because of this sad news, I was not expecting an up-lifting game like this one. Well done. - Jeter's two big hits in the last two innings proved to be the difference in this one. His performance raised his batting average to .289. - Cano has been quietly collecting hits in the No. 6 spot in the order. He added two more tonight, and is batting .382. - Pettitte is eating innings for the Yanks, which is a big key to their success. His final line tonight: 7.1 IP, 6 H, 3 ER, 4 K.
Tomorrow is the day we have all been waiting for: the first game at the new Yankee Stadium. At 1 p.m., CC Sabathia will duke it out with reigning Cy Young Award winner, Cliff Lee. Yogi Berra will throw out the ceremonial first pitch before the game (who else?). In dire need of a win, the Yankees rallied late against the Rays' bullpen tonight to force a rubber match tomorrow afternoon. A.J. Burnett was brilliant (as planned) for eight innings, and even held a no-no going into the seventh. The Yankees did everything right in this one. They took the lead early, and they kept the bats going until the end. Brett Gardner singled off Matt Garza to lead off, and then later scored on a Jorge Posada sac-fly. Then "St. Nick" Swisher led off the fourth with a liner that went over the wall for a homer. Meanwhile, Burnett still hadn't allowed a hit, but had walked Pat Burrell in the second inning. However, when Burnett allowed his first hit in the seventh to Carl Crawford, the Rays wouldn't stop. Evan Longoria and Carlos Pena followed Crawford with singles to put the Rays on the board. Pat Burrell followed with a sac-fly to tie the game at two. The Yankees quickly retaliated in the eighth inning starting again with Brett Gardner. He doubled and then scored on a deep fly ball to left field off Mark Teixeira's bat. After Burnett shut the Rays down in order in the bottom of the eighth, the Yankees stuck it to the Rays' bullpen. Gardner hit a ground-rule double to score Robinson Cano, and then Derek Jeter sealed the deal with a three-run shot to right-center field. Full box score here. The Yankees must have heard about my preview, because the game went pretty much according to my plan. Instead of 6-2, it was 7-2, but I am just content with the win. This win was huge for the Yankees because it shuts up all the fans who thought yesterday's blowout was a big deal. You are going to have a high scoring game no matter what if the starting pitcher doesn't pitch two innings. I'm looking forward to the series finale tomorrow. - Brett Gardner had his first big slugging day as a Yankee; he had two doubles and scored all three times he got on base. He's batting .296 on the year (8-for-27). - Nick Swisher deserves a crown. He homered and doubled today raising his average to .458 (11-for-24). - A.J. Burnett was a stud tonight: 8 IP, 3 H, 2 ER, BB, 9 K. He now his two big wins for the Yanks and is showing what he is capable of. He's also showing that last season wasn't a fluke. Let's just pray he stays healthy! The Yankees will play tomorrow at 4:10 for the decisive third game of the series. Two Andy's will go at it tomorrow: Andy Pettitte and Andy Sonnanstine. Pettitte shined in his first outing, whilie Sonnastine got rocked. We shall see if that means anything tomorrow. After getting trounced last night by the Rays 15-5, the Yankees will face the Rays tonight in the second of three games at 7:08 p.m. I'm excited to see Tex back in the lineup and hitting third, along with Swisher batting clean-up. I like the lineup overall, and predict a 6-2 victory for the Yanks. Nick Swisher is building a solid case for a starting job. But the question is, where can he start everday? Swisher has started the last two games at first base, but only because Mark Teixeira is being extra cautious with his left wrist. Swisher has had a great week, and he deserves a reward. I say, with Matsui's recent struggles at the plate, Swisher should assume full-time DH duties at least until he cools off. I'm coming down hard on Matsui here because of his subpar last season. Matsui needs to reacquire his consistent ways of old if he wants to be a main contributor for the Yankees in '09. Now we can say the Yankees are officially on a roll. Their 6-1 win over the Royals last night marked their third straight. Fans saw a completely different CC Sabathia compared to his opening day start. And in my mind, I think fans saw the real CC last night. The Yankees were playing a perfect ballgame until the ninth inning when the Royals finally squeaked out their lone run, but let's see how they built that lead. Jorge Posada came up with the key hit in the first inning with a two-out, two-run double in the gap in right-center field off No. 52 Horacio Ramirez. The Yanks tacked on two more in the third from an RBI triple from the red hot Nick Swisher, and then another two-out RBI double from Posada. Swisher put on the finishing touches to the Royals in the sixth inning with a two-run bomb to left field. Meanwhile, No. 52 Sabathia was throwing a gem. He was at 98 pitches through seven innings with a 6-0 lead, but he apparently talked his way into starting the eighth inning. He could only record two of the outs before he was yanked, but nobody in the Yankee dugout was mad at this guy. Jose Veras entered and K'ed Billy Butler. He gave up a meaningless run in the ninth, and Sabathia earned his first win as a Yankee. Full box score here. It was another beautiful game to watch. A Yankees team featuring clutch hitting, and dominant pitching. You cannot beat that. Sabathia's fastball was filthy, and his changeup was impressive as well. I'm still learning his pitching arsenal, but from what I saw last night, his fastball was his go-to pitch. Despite the win, the Yankees did have some bad news. Mark Teixeira was a late scratch in the lineup forcing Johnny Damon to be reinserted into the No. 2 slot. Teixeira said that his left wrist caused him to stop taking BP and confess to Joe Girardi. The switch moved Swisher to bat third, and he thrived. - Swisher has wowed Yankee fans in his past three starts (Yanks won all three games). His three RBIs made it nine in just 13 at bats for the season. - Robinson Cano's 15-game hit streak ended today, as he went 0-for-4 with a strikeout. Of course, we all were too high on him too early. Though the Yanks still have a long way to go. - Sabathia showed his guts and his brilliance to the Yankees last night. He gave up six hits, walked none and struck out six. - Veras ended the Yankees' streak of 11 consecutive scoreless bullpen innings. Since Joba Chamberlain's spot in the rotation was skipped last night, he will be pitching today against Royals ace Gil Meche. First pitch is scheduled for 2:10 p.m. ET at the renovated Kauffman Stadium. Tyler Kepner, Yankees beat writer for the NY Times, wrote something in his game recap last night that completely coincides with what I've been saying all along about Robinson Cano. Cano had two more hits on Friday, giving him eight in 14 at-bats so far. He has hit in 15 games in a row going back to last September, when Girardi benched him for lack of hustle in the field. Cano has blistered balls consistently since then, and also shown a better eye at the plate. He walked only 26 times last season — roughly four times a month — but has drawn four walks in four games this week. I completely agree with everything that is being said about Cano here. Cano has definitely displayed his improved patience with his four walks this season, and I am looking forward to watching Cano continue to develop in '09! If you liked what Kepner wrote as much as I did, you will appreciate what he writes on his blog as well. That is the number of days that have gone by since Chien-Ming Wang's last start. His freakish baserunning injury in a game against the Houston Astros forced him out of the game and the rest of the '08 season. Tonight will be the battle for Asia as Wang, from Taiwan, is slated to start tonight against Koji Uehara, from Japan. Wang was coming into his own before he got injured last season, but his numbers this past spring seem to indicate that his sinker is where it needs to be. His groundout/airout ratio was 2.11. I'm a little worried going into tonight, considering the Yankees infield defense was not up to snuff on opening day. Cody Ransom and Derek Jeter better be on their toes. I'm fairly confident with the right side of the infield; Mark Teixeira is a stud with the glove, and Robinson Cano has a strong arm from second. Don't worry about CC and Tex! CC Sabathia and Mark Teixeira had two hurrendous opening days, but are you honestly going to start freaking out about them? I hope not. Their two performances yesterday were nothing like what these players are used to doing. Sabathia walked five batters yesterday, and he averaged 2.1 walks per nine innings last season. Teixeira went 0-for-4 with five runners left on base, and Teixeira drove in 121 runs last season. I wouldn't care if the Yankees lost to my JV high school team yesterday, it's still just one out of 162 games in the season. I don't care if you have the nerves of Mariano Rivera, you will feel pressure if you are trying to earn your entire contract in just one game. For Sabathia and Teixeira, that's $341 million on their shoulders. I expect Sabathia to put up 18+ wins and have pitch 210+ innings, and one bad start is not going to prevent him from achieving those numbers. And for Teixeira, I see him hitting .300 with 30 HRs and 120 RBIs. I'm not worried after one way overhyped game, and neither should you. Just an hour after the loss, I've already received four negative comments regarding the Yankees from my friends. All I can say is that the ball didn't bounce our way today, and there's nothing you can do about that. The Yankees were down 3-0 early, and then fell into a deeper hole in the fifth inning. Hideki Matsui's two-run homer shrank the deficit to 6-5 in the seventh inning. But Phil Coke and Brian Bruney were blasted in the eighth for four runs putting the game out of reach for the Yankees. Ful box score here. I was limited to watching the fourth, fifth and sixth innings, but I noticed a lot of unlucky things happen to the Yankees in this brief span. Like in the fifth inning, when two balls were hit just out of the reach of Cody Ransom's glove, and then a ball was hit right to short stop but Derek Jeter was out of position covering second base for the steal attempt. Three runs scored that inning. - Jeter had a nice day leading off, as he singled three times. Unfortunately, nobody behind him could bring him all the way around. When he singled in the sixth inning, Xavier Nady was thrown out at the plate to end the inning. - Hideki Matsui and Jorge Posada both homered in the game. Posada led off the sixth with a no-doubter to right-center field, and Matsui's was also to right-center field. - CC Sabathia had an awful Yankee debut - maybe a little unlucky - but still walked five batters and struck out none. Yankees get all of Tuesday to mull the loss. They will return, hopefully with vengeance, on Wednesday at 7:05 p.m. Chien-Ming Wang will face Baltimore's Japanese rookie Koji Uehara. Of course, CC Sabathia will toe the rubber for the Yankees. He will be facing off against Jeremy Guthrie, who had a terrible spring and World Baseball Classic. Check back at the end for a game recap. I asked where Derek Jeter should bat in the order. But days after I posted the question, Joe Girardi announced that Jeter would bat leadoff to start the season. The small fan vote did not come to a definitive answer. I guess I can see Jeter batting leadoff. From what I can remember, he didn't do too badly in the 2000 World Series. I just want him to get the first official hit in the new Yankee Stadium, and this lineup shift certainly helps his chances. 4th Featured Yankee Card of the Week! 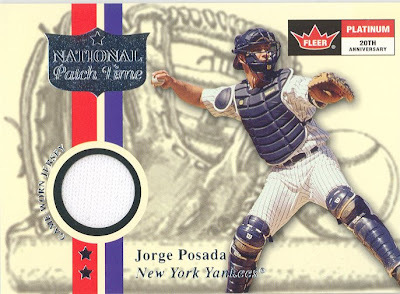 I'm choosing this card because I want to acknowledge the importance of Jorge Posada to the Yankees in the 2009 season. Not only does Posada yield a strong bat, but he also manages the Yankees' pitching staff. Yankees open up their season today against the Baltimore Orioles. I'm sure Posada will be catching for CC Sabathia in this long-awaited game. This card is a 2001 Fleer Platinum National Patch Time. I'm not entirely sure how I got the card, but I have a hunch I hand-picked it from a collectible store. It's not a very valuable card either - only six bucks on the internet from what I found. I value it much more though. It has a piece of his actual jersey on the card! Some of you older collectors may not appreciate it as much, but that's how baseball card collecting has evolved. I have another Posada card with a piece of his bat on the card. I've also heard of shoes, bases and baseballs on cards. It's pretty cool if you ask me. Three all-time Yankees homered and the four relievers were perfect for the final four innings in the first game at the new Yankee Stadium tonight. Chien-Ming Wang gave up three runs in the first two innings, but Robinson Cano and Hideki Matsui homered to give the Yankees a 4-3 lead in the third inning. The Cubs tied it up at four in the fourth, but Cody Ransom's three-run bomb to left field in the bottom of the fourth gave the Yankees a 7-4 lead. Wang pitched the fifth inning and then handed the ball off to Mariano Rivera, then to Jose Veras, then to Edwar Ramirez, and then to Jonathan Albaladejo. The four relievers didn't allow a baserunner and struck out two in the process securing the Yankees first win at the new stadium. Derek Jeter lived up to the hype as he led off the bottom of the first with a double, and went 2-for-2 with a walk for the game. It always seems that in memorable games like these, the Yankees pride overpowers the opponent. The last game at the old Yankee Stadium, Mariano Rivera got the final out. Center field battle: Everybody knew that center field was up for grabs this spring. Brett Gardner ousted Melky Cabrera for the starting job. Gardner lit pitchers up this spring (.377/.441/.623), and ultimately his speed, defense, and potential beat out Melky's experience. Right field battle: I didn't even think this was a battle going into spring, but some people believed Nick Swisher had a chance to beat Xavier Nady for the job. In the end, those people were wrong, as Joe Girardi announced that Nady would start towards the end of the spring. Starting rotation finalized: This was not that big of an issue going into the spring because the Yankees already had five starters. One of the only questions was the order, but that was taken care of. They were probably sticking with the current five as long as none of them totally blew up in spring or got injured. Neither of those things happened, and the rotation looks as good as ever going into the season. Bullpen finalized: Going in to the spring, the Yankees had well over 10 candidates for eight spots in the bullpen. Finally, they've narrowed it down to eight, but the Yanks have many players awaiting their chance to prove themselves in the minors. With Jonathan Albaladejo headed to New York, the Yankees will open the season without a designated long relief pitcher, despite Brett Tomko's impressive spring. Lineup finalized: When Alex Rodriguez went down with a hip injury in the beginning of spring, Yankee fans were stunned and panicking about what the lineup would look like without A-Rod. Utility infielder Cody Ransom came to the rescue, and will be inserted to the eighth spot in the order until A-Rod returns. Another big decision that was made towards the end of spring was swapping Johnny Damon and Derek Jeter at the top of the order. Girardi seems to be in love with that move since it took him less than a week to verify the call. Setup man: Joe Girardi has not officially designated Brian Bruney or Damaso Marte as the setup man for big Mo. Bruney has said that he is assuming he has the job until somebody tells him otherwise, but I'm sure Marte is thinking the same thing. Neither Bruney nor Marte had good springs. I would say, Girardi is going to use one or the other based on the opposing hitters, at least until either dramatically stands out over the other. Utility infielder: When Alex Rodriguez gets back, Ransom will assume the utility infield role. But for now, the battle between Angel Berroa and Ramiro Pena continues. Cashman mentioned that the answer could lie outside the organization, but I find that doubtful. Overall, the Yankees had a good spring. They got a lot done, and only have a couple more problems to solve. Luckily, they avoided major injuries. A-Rod out for the first month is not nearly as bad as it could have been. What if Burnett's arm started acting up? Things could be a lot worse.